I love this series. It takes place in the deep woods and many lakes of the Minnesota - Canada border. There are two other mystery / suspense series that take place in the wilderness that I also like: Nevada Barr's Anna Pigeon series and Paul Doiron's Mike Bowditch Maine woods series. I almost forgot Dana Stabenow's Kate Shugak series, which takes place in Alaska. There's something so exciting and scary about people hiding out in the woods and people looking for the people who are hiding out in the woods. Plus there are all the things that can befall people just out in the woods: accidents, animals, weather. I love it! If you know of any similar series, I'd love to know about them. I've treated myself to buying the whole series via used books stores and the Internet. I'm still feeling sorry for myself after a few stressful months. After reading a few of Krueger's books out of order, I now have them all and will read them in the order they were written, which, presumably, is the story order, too. In Boundary Waters, Cork O'Connor, former sheriff of Aurora, MN, is asked to find a young singing star who has gone on a retreat alone in the woods. Her father, also a famous country singer, thinks something has happened to her. Cork is part Anishinaabe and is trusted by other Anishinaabe on the rez. One of them took the young woman to a remote cabin and has been taking her food and supplies. But now he's missing, too. The FBI shows up looking for the girl. They go off into the woods with Cork and a few others who know the woods. Almost immediately, they encounter another group looking for the girl. There are so many bad men in the woods you can't see the bad men for the bad men! Is everyone a bad man? Will the few good guys find the girl before the bad guys? There's so much suspense, so many times I thought the story was over, but, no, there's another roller coaster ride ahead. Boundary Waters did not disappoint. Donald Langham is a mystery writer and ex-private detective. When his long time agent and friend, Charles Elder is blackmailed over a homosexual indiscretion (this is 1955 London, when homosexuality was a punishable crime), Donald agrees to try to find the blackmailer. Things turn nasty right away, when Donald makes the payment drop instead of Charles and is almost killed. Then Donald notices that an awful lot of fellow mystery writers are meeting untimely and unnatural deaths. 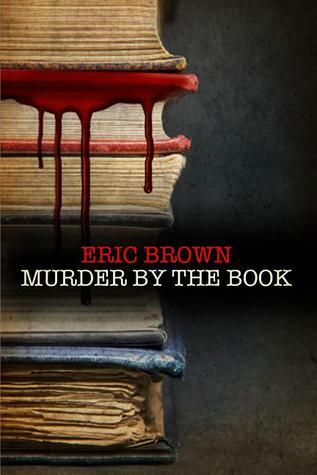 He investigates and realizes that the dead men are being killed as in the books of a certain author. 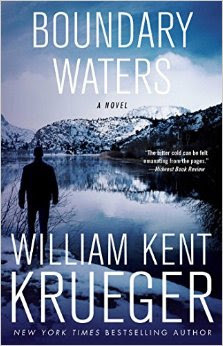 He teams up with the police to find the killer, almost losing his life in the process. Donald has admired Charles' secretary, Maria, a beautiful, wealthy French woman for a long time. They work together to find the blackmailer and to find the killer. They discover that they work - and play - together well. This was a fun book. I've read sixteen of Thirkell's books. I love them, but I love them so much that it's taken me years to read this many. They're the kind of book I save for a rainy day. It's raining today, so maybe I should start another one immediately. It is probably best to read her Barsetshire Chronicles books in order. I've tried my best, but when I started reading them back in the 1990s, they were difficult to find. Now many of them have been reprinted. There is a character progression in the books and her characters grow up. Tony Moreland, son of a best-selling author of potboilers (a lovely character herself), was an inquisitive, self-assured child who was obsessed with trains in prior books. In Growing Up, he's an officer in the military. Lydia Merton, her married name, found love in a previous book and happiness in her marriage in this one. She has gone from a loud tom-boy sort to a more tempered young woman. Her brother is in the military, though, and she worries about him. Leslie Waring often doesn't hear from her brother and she is anxious for his safety. Sir Harry and Lady Waring, Leslie's aunt and uncle, have lost their son at war. Leslie is staying with them after suffering a breakdown from overwork at her important war job. It's a hard time for most people and everyone seems to suffer in one way or another. Leslie falls in love and the course of love is not smooth. But not everything is grim. There's much mild day to day humor. There's romance all around. Selina, the ditzy maid, is pursued by several men and is constantly dissolving into tears of sadness or joy. 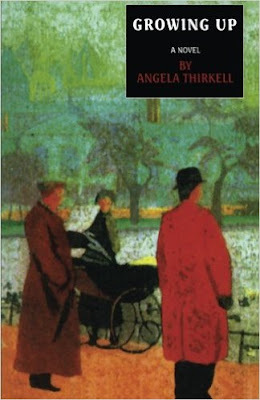 And, this being a Thirkell book, everyone ends up with the proper partner and the home they desire. It's a comforting, light read. Thirkell was an interesting woman. She was Scottish, her father was the Oxford professor of poetry in the early 1900s and her mother was the daughter of the painter Edward Burne-Jones. Rudyard Kipling and Stanley Baldwin were her cousins once removed. It must have been an interesting household. 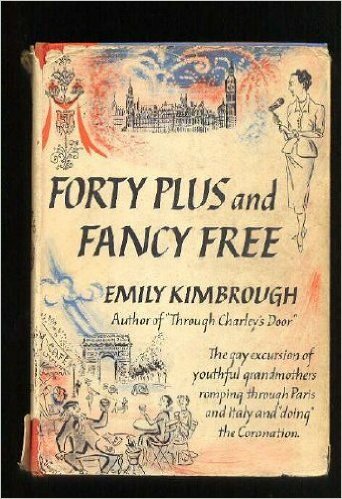 When she was in her early 50s, Miss Kimbrough and several friends took a trip to Europe. She was an author, journalist, and had a radio program on CBS radio. She's probably best known for the book Our Hearts Were Young and Gay, written with Cornelia Otis Skinner. CBS asked her to broadcast the coronation of Elizabeth II in 1953. So she and her friends planned a few weeks of vacation in Italy and France before the big event. This was in the days of travelling large. One of the women has five trunks with her. One woman doesn't want to fly, so she takes a ship and meets them there. They stop in Paris for a while before travelling on by train. It used to be so easy! This is a chatty, personal trip across several countries. Some things seem to be the same, others have changed. It's the kind of book I read with my lap top handy to look up places she mentions that I don't know, which are many. I've been to Italy twice. We spent a week in Venice for an anniversary about fifteen years ago and we spent a day driving from Austria to Switzerland just to have lunch in Italy. I will NEVER drive on those roads in the Alps again!! The ladies travel in a fairly social atmosphere, and by that I mean that they had friends in 'society'. They attended plays and operas in the cities they visited. And they shopped. "Will all householders who are leaving their homes today please make sure their pets are safely inside and off the streets? And will all those driving in from the country make sure their domestic animals are being properly fed and watered? However, should an accident befall there are mobile units for animal care traveling within a radius of fifty miles of the city. One of these may be reached by ringing up (a number was given) and should be at your service within half an hour. One other notice, if you please, and this is very important. Do not light your bonfires tonight until you have ascertained there are no birds' nests in them." I love England! In case you missed me just a little, I'm still here. February is not going as well as January did, as far as reading goes. I've read a few things and I have several books partly read. 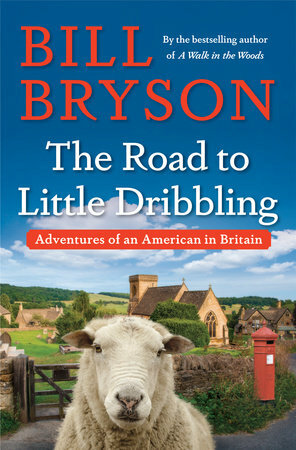 One of the books I read was the latest Bill Bryson book, The Road to Little Dribbling. I'm pretty sure there's no 'Little Dribbling' in Great Britain, but wouldn't you like to live in Mousehole (pronounced 'mowzel')? Some reviewers have complained that this isn't a particularly funny book, as many of his have been. I think that's true, but I think I know why. Bryson and I are the same age and grew up with similar values. Today's world tries us severely. We both mourn the death of community, as well as individualism. That sounds like a contradiction, but it isn't. It makes us sad to see beautiful buildings and landscapes ruined in the name of progress. We shake our heads at the inefficiency and insanity that seems to rule today. Don't get me started!! He can summon up some humor every now and then, but I have to admit that this book left me feeling even more depressed than I usually am. In February, I also read a work of historical romance. Okay, it was an out and out bodice ripper, called, get this, The Rogue Not Taken. I haven't read one of those since I was a teenager. I think I can wait a few more decades before reading another, although it was a fast and sort of fun read. I also read A Faint Cold Fear by Karin Slaughter. I thought I was really enjoying it, but by the end, I was tired of the characters and a little confused by the outcome. I'm not sure I know who the murderer was. Or were there two murderers. I can be a trifle dense. I mailed off our tax info to the nice man who does our taxes and I sent off two e-mails about an ongoing issue in my neighborhood. Now the balls are in other people's courts and I can, I hope, settle into reading again. I hope you're having a good February. Goodness, it's half over already!